Over the past several years, the involvement of religious organizations in the earth’s environmental stewardship movement has gathered momentum. In towns and cities across America, people of many faiths are rolling up their sleeves in practical and far-reaching ways in response to a faith-filled call to re-examine what it means to be human and how we must live on this planet for survival. In Massachusetts, the Massachusetts Conference of the United Church of Christ (MACUCC) and the Massachusetts Department of Conservation have established a state-wide environmental social action facilitation ministry - the MassReLeaf Ministry - as a part of this national religious-environmental movement. 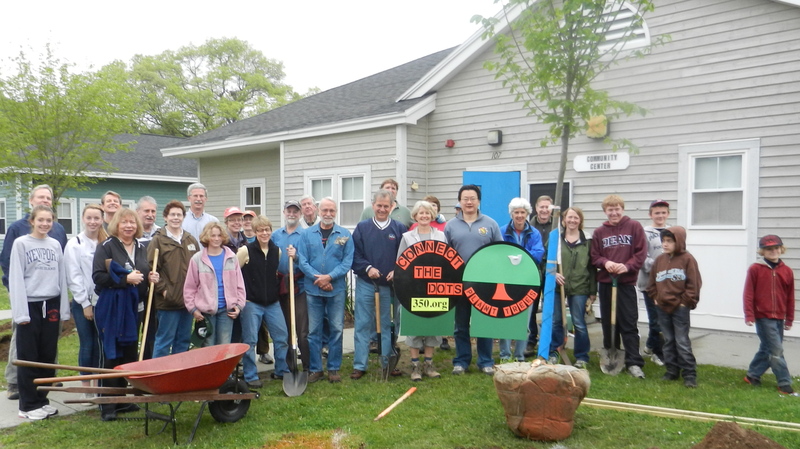 The MassReLeaf Ministry recently completed ten years of facilitating tree-care projects led by local religious organizations of any faith on public and access qualified lands across Massachusetts. A unique and completely nourishing natural environment to sustain all life as we know it. The gift of intelligent human life. Other creatures and vegetation on earth. The responsibility and ability to nurture all of the above precious gifts to support the survival of humankind. Emphasize the responsibilities of everyone to care for the welfare of others through environmental action. Help bring environmental justice into the lives of everyone, especially people most in need in our state. Participate in active citizenship with municipal governments and other local organizations as a way to successfully provide environmental benefits to the maximum number of people - people are mainly concentrated in population centers. Develop a greater understanding of the needs and benefits to humans provided through environmental activism. The MassReLeaf Ministry offers local religious organizations, working in coordination with their respective municipalities and other l ocal organizations, unique opportunities to lead real, hands-on tree-care projects to improve the quality of our shared environment and enhance the lives of thousands of citizens living in population centers across Massachusetts. This ministry brings the idea of human environmental justice into the neighborhoods and lives of those most in need in our state. 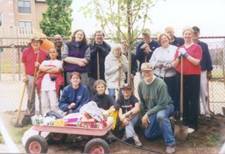 The MassReLeaf Ministry provides a services and materials infrastructure that enables local religious organizations of any faith to lead successful local tree-care projects. Education about theological environmental responsibilities and the benefits provided by trees to humans in an urban setting. Connections with appropriate local municipal counterparts to help plan and conduct tree-care projects. Proper tree-care and maintenance technique training. Technical support resources to ensure success of their respective projects, if needed. So, MassReLeaf Ministry projects cost local religious organizations little more than their desire and effort to plan and conduct environmental social action service projects, similar to the way they currently support other ministries like Habitat for Humanity, Greater Boston Food Bank, Rosie’s Place and many others. Our urban and community forests reduce levels of pollutants such as solid particles, ozone, nitrogen dioxide, sulfur dioxide, carbon monoxide and others that seriously impact human physical, mental and emotional health negatively. Each urban tree absorbs an average of .46 tons of the above toxic gases per year. reduce heating and cooling needs for residential buildings thereby reducing costs. reduce the “urban heat island effect" (localized heating due to the preponderance of black topped surfaces) to provide a more human-friendly living environment. reduce rainfall runoff and erosion, thereby improving water quality and quicker re-charge of local aquifers. function as habitat for wildlife to enrich human enjoyment of these creatures. contribute to the reduction of global warming for the long term security of the Earth. So you can see that there are enormous human benefits to maintaining healthy urban and community forests in our population centers. To date, the MassReLeaf Ministry has facilitated 42 tree-care projects led by local religious organizations in communities across Massachusetts. 45 local religious organizations have participated in these projects (along with local municipal counterparts and other community organizations) and planted 744 trees (200 to 350 pounds each). In addition, the MassReLeaf Ministry provided 290 seedlings to the UCC Massachusetts Conference 2011 Annual Meeting to emphasize the importance of planting trees in the religious-environmental movement and to have local UCC churches across Massachusetts plant them on their local church properties. All of these seedling trees were taken home by people attending the Annual Meeting from the UCC local churches. The MassReLeaf Ministry also offers a program to support planting trees on “Access Qualified Private Lands” (such as local religious organization properties) as part of religious environmental events. 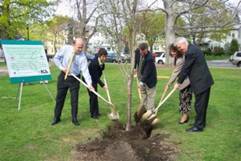 The goal of this new program is to offer a simple way to get local religious organizations interested in planting trees for the environmental benefits they provide to people in municipal areas and as a small way to help reduce Global Warming. 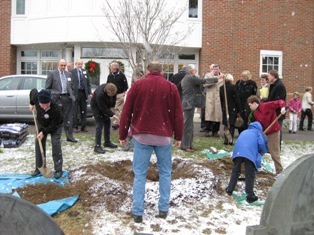 The first of these “Access Qualified Private Lands” projects was completed by the Wellesley Congregational Church in December, 2009 as a practical service complement to their “350 Bell Ringing” religious environmental education event. • Reimbursement of the cost of trees needed to conduct tree-care projects on “Access Qualified Private Lands” as part of religious environmental events. • Education about theological environmental responsibilities and the benefits provided by trees to humans in an urban setting. • Proper tree-planting and maintenance technique training. • Technical support resources to ensure success of their respective projects. To get started on a MassReLeaf Ministry supported “Access Qualified” tree-care project, please contact one of the MassReLeaf Ministry personnel shown above and we can explore together the planning needed to conduct such a tree-care project. Applications/requests for MassReLeaf Ministry support for spring projects must be received by the MassReLeaf Ministry not later than March 31 of that year, and for fall projects, no later than September 15. 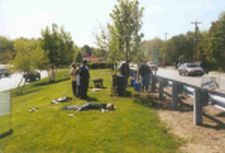 Click here to read the article about an example Mass ReLeaf Ministry project described in the June, 2006 edition of the DCR Citizen Forester.